What RAL demo did Mick Jones play on? Ok Stevie trivia people please answer this question. I have been wondering this since 1984. As a teen and frantically waiting for Stevie's next album, I would buy or look through every music magazine hoping to get any updates on Stevie's upcoming album. 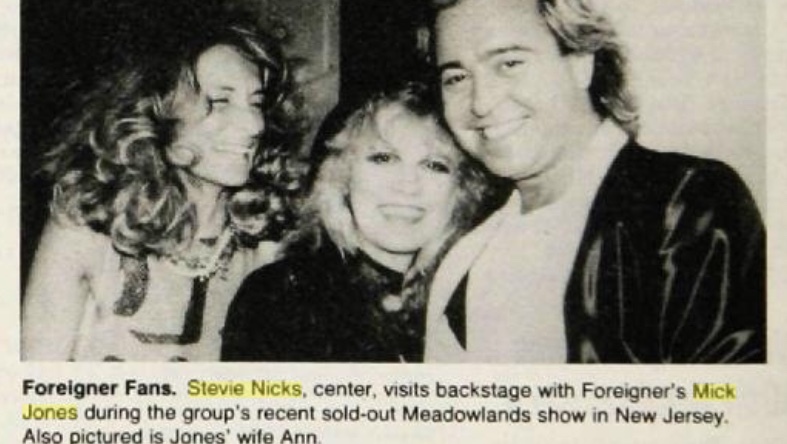 There was a snipped in Hit Parade or another magazine that said Mick Jones of Foreigner had a secret jam session with Stevie Nicks working on tracks for her upcoming solo album. Now does anyone know what demo this was? I don't believe he is credited on any RAL album cuts so it must have been a demo. Maybe its one we never heard? If anyone knows please answer. Interesting tidbit. I do not know. Must have missed that issue of Hit Parader. Yes, it was a highly anticipated album from Stevie. Seemed like it was one of those albums that took forever to get released. I vaguely remember the Mick Jones mention but I can't remember anything that ever came of it. I also recall that Stevie and Bob Seger were working together. Probably some of the things that got canned, stuck in a vault, somewhere. While I don't care for the RAL album, I really like the RAL demos. Can you imagine the ones we have not heard. For that reason alone, I would love to see a RAL deluxe release. RAL had huge potential but it was a losing battle. Anyway, I remember at the time how excited I was to read who Stevie was working with during that year. But sadly few of them showed up on the album. For the first time in ages, if ever, I just listened to it in its entirety. I disliked every song except for "Talk To Me" "I Can't Wait" and–to a certain extent–"Has Anyone Ever Written...." Basically, I really liked only two songs. To think she had better material that she left off is disappointing. I think this is where the firing of Jimmy Iovine proved itself to be a bad move. The album is also way to synthesized. While Bella Donna also has a little too much synth (just a little), by contrast to RAL it sounds much more natural. Her model for a solo sound, Tom Petty & The Heartbreakers, almost never used synths. They had to twist Benmont Tench's arm to get him to play it on "You Got Lucky." Last edited by cbBen : 12-22-2018 at 05:37 AM. I don’t know either, but I found this old photo of them together backstage at a Foreigner show in November 1985. It’s kind of staggering the number of people she worked with, or who tried to work with her, during the RAL sessions. It seems like she was kinda flailing around looking for a hit (mostly in all the wrong places) during both this and TISL. I think TISL was more orderly. She had Shery Crow produce as much as she could, given the constraints of Sheryl's own career; then had John Shanks produce the rest. Interesting to note that Shanks is the only one (so far as I can tell) that has produced both Nicks and Buckingham. He co-produced "Peacekeeper" "Steal Your Heart Away" and "Bleed to Love Her" when they were Lindsey solo tracks: https://www.discogs.com/Fleetwood-Ma...elease/1615701 – unless he entered the picture on these songs when they were made into Mac songs (which is possible, as he also co-produced "What's The World Coming To"). In any case, we don't see or hear of him in Destiny Rules. Last edited by cbBen : 12-22-2018 at 09:42 AM. I really like RAL, I can listen to pretty much every song on it without skipping a track. I've read that the album appears to be a subconscious attempt on Stevie's part to lighten up, especially following The Wild Heart, and I agree it's definitely much lighter in tone, and more commercial, too. That would help explain why songs like Thousand Days, Reconsider Me, and Battle of the Dragon were left off RAL. Besides the three songs you mentioned, I really like If I Were You, the Nightmare, and Imperial Hotel. I'm not that familiar with his work to pick out his guitar, but it's fun to imagine he's on one of the seemingly countless "Mirror, Mirror" demos. "Played on a demo with Steve Nicks" could also be a euphemism for him hearing she was having an all-night cokey party in the recording studio and he dropped by to score. Yes, and "jam session" could also just be hanging out playing music without recording anything. It was originally going to be called Mirror Mirror. I liked that tracklist better too. I'll bet there are still a lot of stuff in the vaults from those sessions.